I’m sorry to have had a brief hiatus but things have been a little bit crazy around here. I just received a huge promotion and will now be the Director of Marketing at my current job. I am so excited about it but I’ve been trying to get things in order while they search for my replacement and being trained for my new position, so my brain has turned to mush. 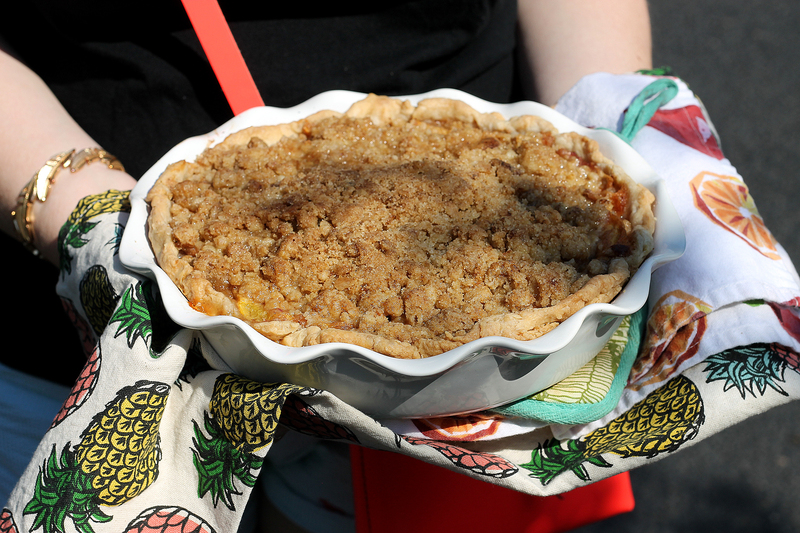 But its the perfect time to come back with this delish brown butter bourbon peach pie. 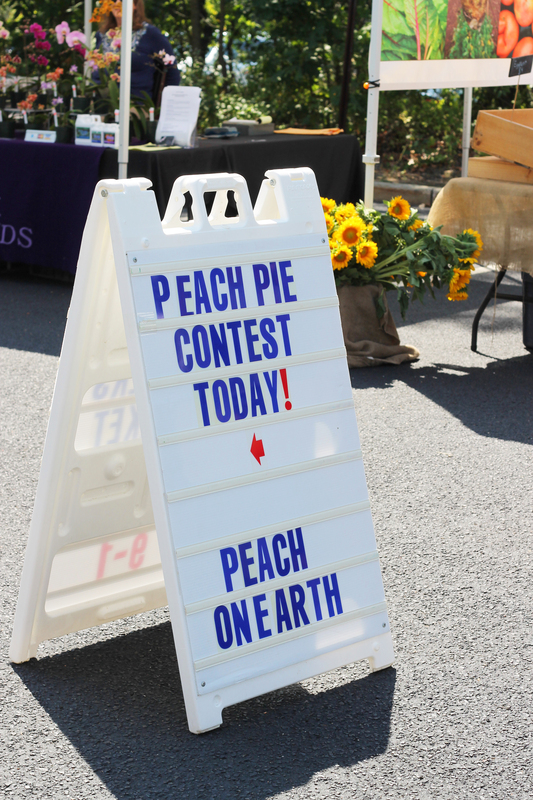 Our local farmers market has started these seasonal fruit pie contests. You might remember I participated in the blueberry pie contest a couple of months ago and we just had the peach pie contest. 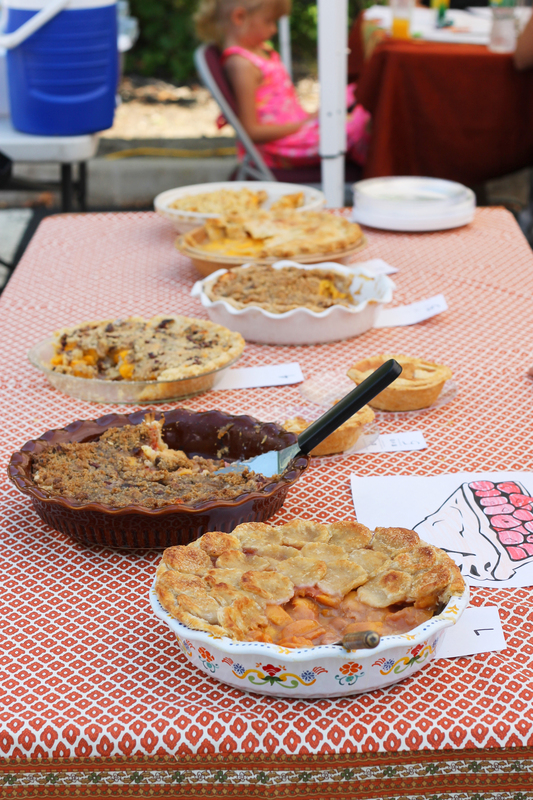 There were about ten pies or so that participated and our judged by local bakers, food critics, food bloggers…its rather intimidating! They may have not voted mine the best, but my coworkers RAVED about it. So I think its worth your time and effort! Although I spent a lot of time researching recipes I ultimately combined a few recipes. you’ll only need half but make a full batch and freeze the other half to save work for next time. Make pie crust according to Smitten Kitchen instructions. Once rolled out in the pie pan and crimped, place in fridge while you make the filling + strusel. Preheat over to 425F. Place a small “x” on th bottom of each peach, drop in boiling water for 30 seconds and the remove and place into cool water. You can then peel the skins off easily and slice the peaches. Place peeled and sliced peaches in large mixing bowl in the fridge. Mix the cornstarch, flour, cinnamon, salt and allspice together and set aside. In a small skillet, melt the butter over medium heat for about 5 minutes until it turns brown, make sure to stir it the whole time so it doesn’t burn. If it browns too quickly take it off the heat and keep stirring. Once browned, take off the heat and mix in 2 tablespoons bourbon. Pour brown butter bourbon over the peaches and then pour in the cornstarch mixture. Mix it around the peaches with a spatula so everything is evenly coated. Be careful to not shred the peaches as you mix them – they are delicate! Pour the peach mixture into the pie crust and pop back into the fridge while you prepare the streusel. in the same skillet you used before, melt a stick of butter over medium heat, stirring frequently. Cook until the butter turns golden-brown, about 5 minutes. Remove from heat and set aside once browned. Whisk together the flour, sugar, dark brown sugar and salt. Drizzle over the browned butter and mix until crumbs form. Sprinkle the streusel of the peach mixture until completely covered. Cover the pie crust with foil and place in the over for 15 minutes. You may want to put a cookie sheet under to catch anything that might bubble over while baking. Remove the foil, reduce heat to 350F and cook an additional 40 minutes. The crust should be golden brown and the pie will be bubbling when the pie is ready to come out. Cool for at least a couple of hours. This helps the pie set up and not be drippy/gooey. Enjoy warm with a scoop of vanilla bean ice cream! Categories: Good Eats | Tags: bourbon peach pie, dessert, fresh fruit pie, peach pie, recipe, southern pie, summer dessert, summer pie | Permalink.